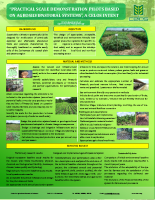 As far as research is concerned, the Agricultural Production department studies cultivation techniques with minimal harmful impact to the environment in the cultivation of root crops, cereals and legumes, with benefits for various agricultural regions. 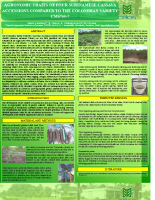 The department is mainly responsible for delivering results for increasing agro-production, food security and food safety and has expertise in the field of mechanized cropping systems and plant genetic resources.The department pays attention to, among other things, describing the locally occurring and newly imported varieties of agricultural crops (agro-biodiversity) and obtaining sufficient and pure plant material. 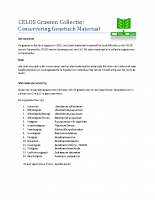 Cassava gene bank: On the test fields at Phedra and Tijgerkreek-West, CELOS has an ex-situ cassava field gene bank whose phenotypic characterization data are recorded in a database. These gene banks are continuously rejuvenated at the end of the growing season. Grass collection: On the CELOS site at the Leysweg a collection has been laid out with grasses. 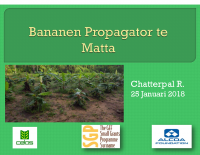 Plant propagation: We provide training on the rapid multiplication of cassava and banana. 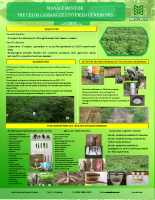 Cassava dry matter: On the CELOS experimental site Tijgerkreek West, the so-called cassava dry matter field experiment was recently carried out during two growing seasons. The collected data are being analyzed. © 2018, CELOS. All rights reserved. 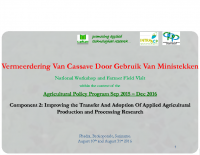 The Foundation Center for Agricultural Research in Suriname, CELOS, was established in 1967 as a branch of the agricultural college of Wageningen, the Netherlands in 1967.